A direct secondary refers to the buying and selling of an investor’s ownership in a privately held, frequently venture capital or private equity backed company. Distinct from the limited partner secondary market, the direct secondary market is characterized by a transfer of a directly held ownership interest in a company rather than a transfer of a fund of a fund interest or indirect ownership stake. The direct secondary market creates an option for management and investors to sell their stock when the entire company is not being sold. Investment stakes can be sold in a single company or across an entire portfolio of companies. 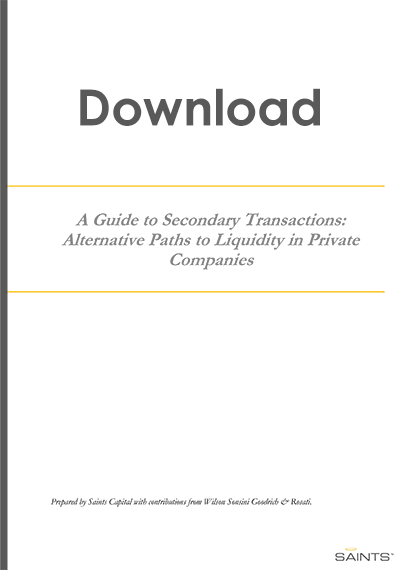 The sale of private company shares on the secondary market is becoming increasingly prevalent as the timelines to reach a liquidity event have lengthened over the last decade. This trend has recently been exacerbated by institutional investors (banks, insurance companies, family offices, hedge funds, mutual funds) decisions to sell non-core investments and seek short-term liquidity, and senior executives looking to monetize some of their stake in companies before the company has matured enough to go public.